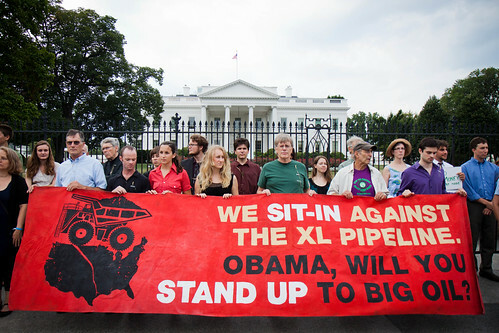 Hundreds gathered outside the White House in August to urge Obama to reject the Keystone XL tar sands pipeline. Photo by tarsandaction under a CC License. The Canadian tar sands is often called the biggest and most destructive industrial project on the planet. If we want to prevent catastrophic climate change this is where the line must be drawn. The action currently being undertaken in the US to halt the Keystone XL pipeline is a crucial battle in the fight to end tar sands extraction. Taking on Tarmageddon: Trailer from Taking on Tarmageddon on Vimeo. Earlier this year I spent two weeks filming the documentary Taking on Tarmageddon following a group of students from the UK campaign network People & Planet investigating the tar sands. At the invitation of the former chief Al Lameman, we spent our time there staying with the Beaver Lake Cree Nation who are at the front lines fighting the oil companies to preserve their land, their hunting grounds, their health, even their way of life, both traditional and modern. One of the first things to hit me was the contrast between where we were camping on the reservation and the utter destruction that we would see when we visited places like Shell’s Scotford Upgrader or Devon’s Jackfish in-situ projects. It made it all the more real what stands to be lost on a local level from the tar sands. Taking on Tarmageddon: In-situ Extraction sites from Taking on Tarmageddon on Vimeo. This was further compounded when we attended the Beaver Lake Cree Nation Pow Wow. As we watched the dancers in their amazing costumes the complexity of the issues around the Beaver Lake Cree's fight against the tar sands began to sink in. Earlier that day we had been chased by security around various in-situ extraction sites near Conklin. The first shot of the video from this trip shows the level of destruction caused by tar sands. So this might seem black and white, but the only reason we were able to get around the in-situ sites was that our driver from the Beaver Lake Cree reservation was a former oil-patch worker. And that's the issue with the tar sands in Canada. Everything and everyone is linked to the tar sands. Every job in some way contributes to the oil industry. It was not an expected finding for us. We were very lucky to be able to interview a First Nation man who is a former oil worker. He told us about how every day on his way in he had to drive past a native burial ground in the middle of an oil patch. He had to look at it, fenced off and surrounded by total devastation to the natural world. He told us that if he was to go to it and make an offering of tobacco, even just to throw a couple of cigarettes over the fence, he would lose his job. He got to the point where he just couldn't do it anymore, he was faced with making a decision that involved not only quitting that job, but refraining from having anything further to do with the oil sands. However, he couldn't say he'd never go back, he had to make the decision between living by his morals and providing for his family. This is the same choice that faces every Albertan: do they provide for their families doing something so destructive or do they struggle to find work elsewhere? While we were driving around Conklin we saw early construction and clearing work on the Harvest BlackGold project due to start producing bitumen in 2015 at an estimated 30,000 barrels per day. Due to this massive expansion in tar sand operations it is estimated greenhouse gas emissions from all tar sands projects will increase from 27 million tons per year in 2006 to 144 million tons per year in 2020. And it is only because of this expansion that projects like Keystone XL are even being considered. The students in Taking on Tarmageddon are in the UK now planning their campaign. The film will be a crucial part of this campaign, allowing them to communicate their message further and wider than they would otherwise be able to. In November a group of young people from the Beaver Lake Cree Nation will come to the UK to continue building international solidarity to bring and end to tar sands extraction and a genuine transition to renewable energy. Pete Speller is a video journalist, blogger and campaigner based in Oxford, UK.